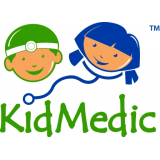 Kristy Taylor is a full time health science professor and writer; she is also the founder of Kid Medic. Mrs. Garcia's Class Visits the Hospital is an exciting career day adventure with a diverse group of characters where the students in Mrs. Garcia’s class visit the local hospital for their class field trip. While touring the hospital with Mrs. Garcia and Dr. Johnson as their guides, the students learn about over twenty different healthcare careers, and they have lots of fun along the way!